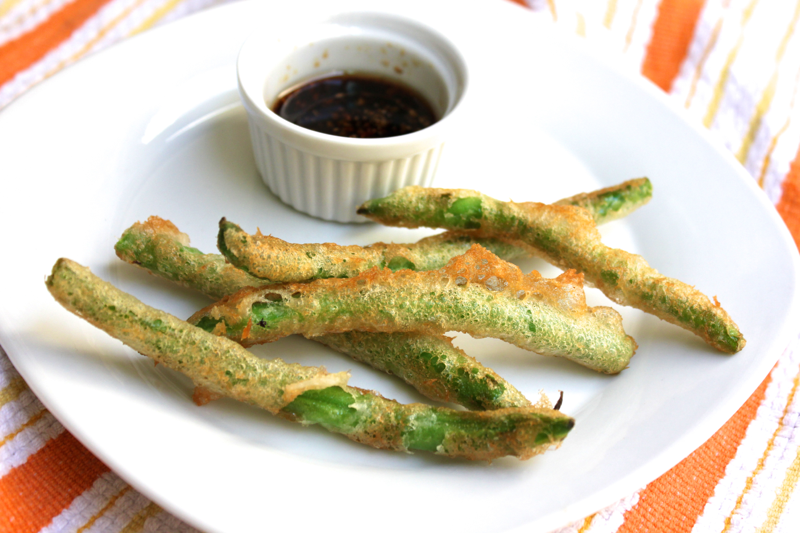 I grew up eating string bean tempura. For as long as I can remember, my whole family would meet for dinner at a hibachi restaurant, where the meal has remained consistent for, quite literally, my lifetime. First comes hot hand towels, followed in succession by soup, salad, shrimp and string bean tempura, the hibachi meal, and then the best vanilla bean ice cream, which my uncle would routinely melt into ice cream soup on the still-hot cooktop. For all of these years, the string bean tempura and its delicious dipping sauce have been my absolute favorite part of the meal. String bean-only tempura is rarely found elsewhere, and it’s never as good. 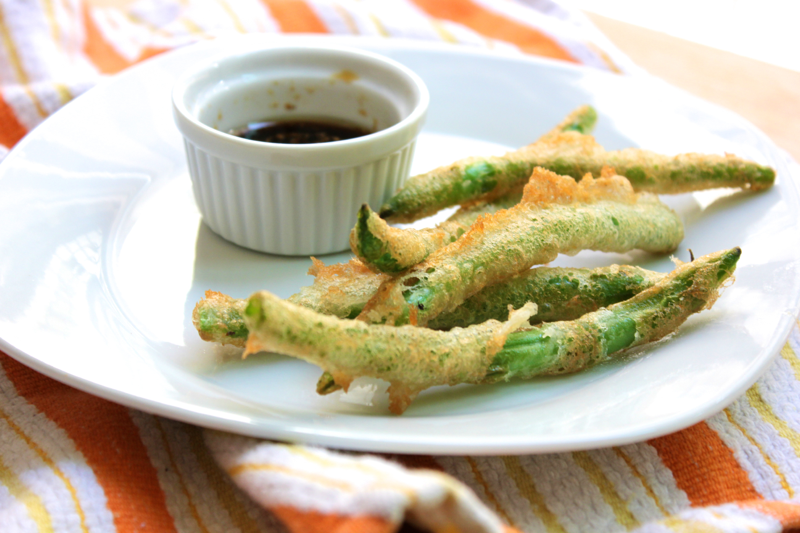 String bean tempura (really any tempura) is shockingly simple to prepare, it cooks quickly, and it is guaranteed to draw crowds into your kitchen. To make it, rinse your string beans, and use a knife to trim off their stems. 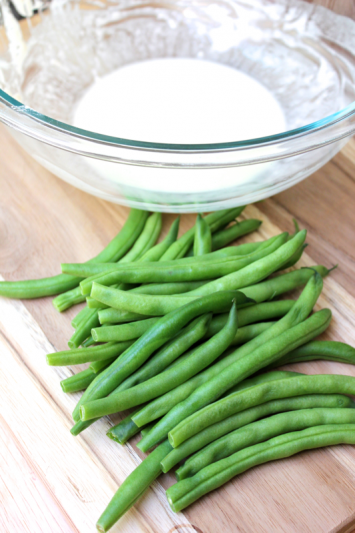 Dry the string beans off with towels or in a salad spinner. Heat your cooking oil either in a deep fryer, wok, or heavy pot. 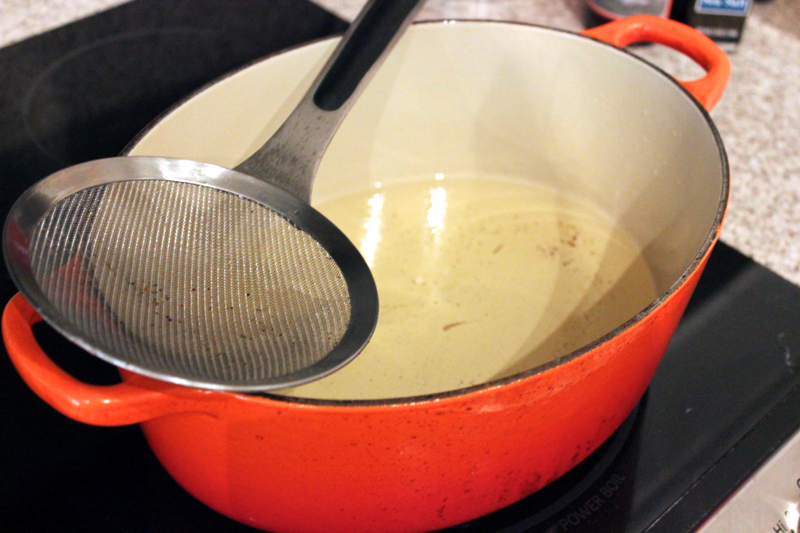 Use an oil with a high smoke point– I used sunflower oil, but peanut oil would also work well. If you have a candy thermometer, you can heat the oil to approximately 350º F. Otherwise, heat the oil over medium high heat, and adjust the temperature in response to frying conditions, as I describe later. To make tempura batter, put 1/4 cup of flour and a few dashes of salt into a bowl. Stir in enough beer for the flour to take on a batter-like consistency. A thinner batter will make a thinner crust, and thicker batter will a make a thicker crust (the batch photographed here was pretty thin). Adjust the beer and flour ratios to suit your preference. The beer adds great flavor and also makes the batter puff up in the oil. Some recipes suggest using soda water if you’re averse to beer, but I haven’t tested it and would miss the subtle beer taste. 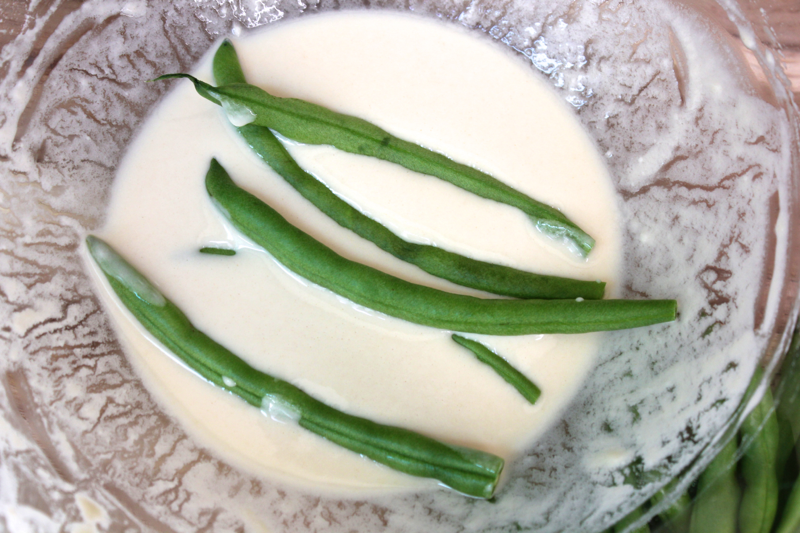 Add some string beans into the bowl, and turn them to coat. Drop one string bean into the oil to test the temperature. The batter on the string bean should begin bubbling and puffing almost immediately. Adjust the temperature of your oil until you get and can maintain this reaction. Remove the test string bean and discard it (in your mouth). Set up a tray lined with paper towels for draining. Then, drop a handful of string beans around in the pot into the oil, taking care not to overcrowd them. The string beans are done when they just begin to brown, which can take anywhere from 10 seconds to 1 minute depending on the thickness of your batter and the temperature of your oil. Remove the string beans from the oil, and let them briefly drain on paper towels. Serve the string beans immediately with your favorite dipping sauce. To make an addictive but simple one, stir together 1/4 cup of reduced sodium soy sauce, 1 teaspoon of grated ginger, and 1/2 teaspoon of sesame oil. Yum! I made these string beans at the most recent meeting of the Global Supper Club: Japan Edition. My friends joined me in the kitchen while I fried batches of the string beans, and we sipped sake, snacked, and caught up. It was so much fun. The meal was another fantastic showing with the best miso soup I’ve ever eaten (I’ll try my hand at it and let you know how I do), seaweed salad, tamago nigiri, salmon onigiri, salmon teriyaki, sushi, soba noodles in cucumber cups, green tea and honey ice cream, mochi, green tea truffles, and other Japanese candies. A solid showing all around, and deliciously fun. N O M ! ! !